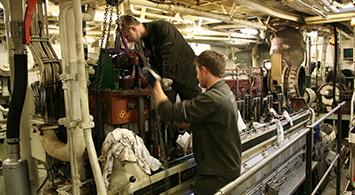 We carry out all types of engine work, including total repair, maintenance, replacement, and installation of engines. We have the equipment and the facilities for reconditioning/machining engine parts, including repair of cylinder heads, pistons, connecting rods, cylinder liners, pumps, fuel nozzles, radiators, thermostats, and valves, just to mention some of them. We renovate all types of gears and couplings. Including renovation of bearing housing , gears, all types of switches , laser alignment of the gear etc. 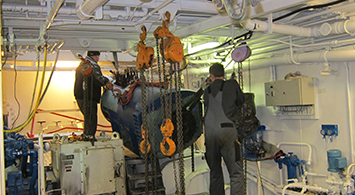 MarineShaft A/S has been appointed to be the sole service department of REINTJES marine gearboxes in Denmark, Greenland and the Faroe Islands. MarineShaft cooperates with Bech Engineering A/S, who is the only authorized provider of the complete range of spare parts for REINTJES gearboxes in the same region. MarineService A/S is ISO 9001:2015 certified by Bureau Veritas.